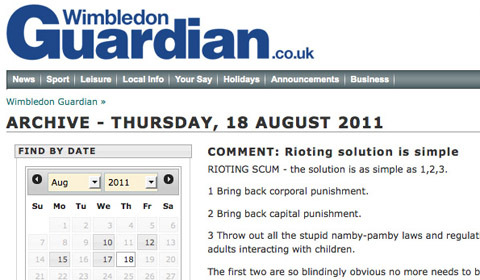 Earlier today I spoke to group editor of Newsquest’s South London titles, Andy Parkes, who refused to confirm whether or not he had penned an editorial printed by the Wimbledon Guardian and Streatham Guardian calling for the return of the death penalty and corporal punishment. Parkes did say that we could “put his name to it”, claiming that it was “tongue in cheek” and a “just a bit of fun”. The piece – and Parkes subsequent comments to Journalism.co.uk – proved to be controversial however and he was asked to appear on BBC Radio Scotland this afternoon alongside Guardian blogger Roy Greenslade, who first blogged about the editorial. Parkes admitted on the show to writing the leader, and said that he stands by the call for the death penalty and corporal punishment to be reinstated. This entry was posted in Local media, Newspapers, Press freedom and ethics and tagged andy parkes, Local newspapers, Newsquest, regional media, Roy Greenslade, streatham guardian, wimbledon guardian on August 19, 2011 by Joel Gunter. The Manchester Evening News has proved that long-established newspapers can shine online, following Roy Greenslade’s criticisms of some London local newspaper publishers for what he considered weak web riot coverage, with their focus instead being on print editions. The MEN had around 25,000 people viewing its liveblog at any one time between 8pm and 11pm last night (9 August), one of the paper’s digital editors, Lee Swettenham, told Journalism.co.uk. We didn’t want to fan any flames so held off from liveblogging until something concrete happened. The liveblog was started shortly after 6pm, once it was clear riots were taking place in Manchester and Salford. We had half a dozen reporters out tweeting and taking pictures from the whole area. We received thousands of comments on the liveblog, including lots of very positive feedback. We were providing information such as travel news. MEN used liveblogging platform Cover it Live which “worked perfectly” despite heavy traffic. It shows that if you do it properly online the audience and interest is there. We shone compared with a lot of the national media. It just shows how valuable we still are. But where the MEN excelled, readers of the Birmingham Post could be forgiven for failing to realise rioting had taken place in the city. Just two of the five top stories on the home page carousel are about the riots, the others include a cinema reopening as an independent, a story how a Hong Kong “newspaper shakeup gives Birmingham City investment hope” and a top story about Dragon’s Den. Sister title the Birmingham Mail had more riot coverage on its home page but its site design means it failed to shine (see pictures below which illustrate this). UPDATE: Responding in the comments section below, David Higgerson, who is head of multimedia at Trinity Mirror, explains the stats prove readers have been going to the Mail and Post for news of the riots and more. Both sites have seen unprecedented levels of traffic over the past three days, and have devoted many, many man hours to covering the story in a responsible way. The riots coverage is prominent on the home page, but our traffic analysis also demonstrates that people are interested in more than just the riots – hence the promotion of other content on the site. In the case of the Birmingham Post, it is a relied upon source of business information for the city and people expect to be able to find that too. The Birmingham City Football Club story you reference is a very important story, and has been very well read. Like the MEN, and the Liverpool Echo, the Birmingham Mail and Post sites have run a live blog, and will continue to have reporters working in difficult circumstances to ensure we bring our readers the best possible coverage. Your analysis of the Post and Mail v the Redbrick coverage seems to centre on not liking our front page design. That’s purely a matter of taste. If you apply the logical web publishing question of ‘Can people find the content they are looking for?’ to our home page, then there’s no doubt those looking for riot coverage will find it, as will those people looking for the content they also expect – other news, business news, sport and so on. Wolverhampton’s Express and Star, which is behind a part-paywall does well, making its riot coverage available to non-subscribers. Compare the home page of the Trinity Mirror-owned Birmingham Post (which does have riot video content further down its front page) and sister title the Mail with that of Redbrick, the University of Birmingham’s student newspaper. Hardly surprising, therefore, that Redbrick has seen 93,000 visits and 148,000 page views since 7 August. And because it is summer, and most students are out of the city, it has been co-ordinated from afar. The editor, Glen Moutrie, an economics student, is in Singapore, and just two student reporters are on the ground getting stories. We are doing a lot of it through Twitter, keeping a check on hashtags and following things up. I’ve also been chatting on Facebook and have managed to do things such as organise a statement from the MP. Meanwhile The West Londoner, a blog that is the work of another student covering the riots, has seen a million views in one day. So if a group of unpaid students can get to the heart of the story when the editor is the other side of the world, newspapers which have suffered the closure of their town centre offices in favour of out-of town news hubs should be able to cope. That is exactly what happened at the Hackney Gazette, which moved from its Cambridge Heath Road office, a short walk from the location of looting on Monday night, to Ilford, Essex, which is nine miles away. But far from being removed from the story, the Archant-owned weekly has one reporter who works from their Hackney home. Emma Bartholomew was able to get on her bike and go in search of the story. She described the scene she was reporting on as “a little intimidating”, as she witnessed bricks were being thrown by rioters. It seems location is less important as long as some reporters are able to go out, tweet, upload videos and get the story. The problem, as Greenslade said, is not to do with the journalists who have shown themselves to be perfectly capable, but with their print-minded publishers. The problem could not be clearer. Local newspapers remain wedded to print. They are just not set up to report online, even if their journalists have engaged with new media tools. So long-established local newspapers must focus on their online content, on site design, allowing a story to have sufficient impact if they are not to be outshone by students working without a budget and with an editor posting from the other side of the world. This entry was posted in Citizen journalism, Hyperlocal, Local media, Online Journalism and tagged Emma Bartholomew, Glen Moutrie, Lee Swettenham, liveblogging, Redbrick, Roy Greenslade, The Birmingham Mail, the Birmingham Post, the Hackney Gazette, University of Birmingham on August 10, 2011 by Sarah Marshall. The Guardian’s Roy Greenslade reports today that book deals relating to the phone-hacking scandal have already been signed. This includes one for Guardian journalist Nick Davies, of which is said to be “provisionally” titled Hack Attack. It’s scheduled for release in autumn next year. So it looks as though Labour MP Tom Watson will get in first because his tome, for Penguin Press, is due to be published before the end of this year. It is being co-written with Martin Hickman of the Independent, a former journalist of the year. Greenslade adds that “there is not the least sense of competition or animosity between Davies and Watson”, with the story big enough for the two of them, if not more. This entry was posted in Business, Editors' pick, Investigative journalism and tagged book deals, guardian, Nick Davies, phone hacking, Roy Greenslade, Rupert Murdoch, Tom Watson on July 26, 2011 by Rachel Bartlett. Yesterday we reported on the BBC Trust ruling that Panorama had broken editorial guidelines of fairness and accuracy in its programme Primark: On The Rack. The BBC was ordered to make an on-air apology over the documentary, which was broadcast in June 2008, after the Trust said the programme contained footage that was likely not genuine. Roy Greenslade said the Trust’s decision was “baffling”. Dan McDougall is an intrepid, award-winning investigative reporter with a superb record in exposing human rights violations. Frank Simmonds is an experienced producer who has been responsible for many important revelatory Panorama programmes. Yet this so-called judgment – which requires the corporation to apologise for the documentary – puts a black mark against their names on the most tenuous of grounds. Having studied the report, I believe the Trust has got this wholly wrong. This entry was posted in Broadcasting, Editors' pick, Press freedom and ethics and tagged BBC, BBC Trust, Broadcasting, panorama, Roy Greenslade on June 17, 2011 by Joel Gunter. On his blog today Roy Greenslade outlined the libel case Christopher Jefferies is bringing against the Sun, Daily Star, Daily Mirror, Daily Mail, Daily Express and the Daily Record. Mr Jefferies was arrested in December, as part of the Joanna Yeates murder investigation, and later released by police having been eliminated from their inquiries. Greenslade said at the time of Jefferies’ arrest he wrote about the press coverage “arguing that it amounted to a character assassination”. Law firm Simons Muirhead & Burton partner, Louis Charalambous, leads the team representing Mr Jefferies. A statement released this afternoon by the firm stated: “Mr Jefferies will be seeking vindication of his reputation for the terrible treatment he received”. This entry was posted in Editors' pick, Legal and tagged Christopher Jefferies, joanna yeates, libel, Roy Greenslade on April 21, 2011 by Sarah Booker. Roy Greenslade has written a thorough round-up on how the weekend newspapers covered the News of the World phone hacking apology. He also looks at the coverage – and non-coverage – in today’s papers. But where will those headlines appear (and which papers will remain silent)? There is a clue in today’s papers. The Guardian carries a page one story, Civil service blocked hacking probe. The Independent runs two pages under the headline Lawyer claims up to 7,000 may have had phones hacked, plus a leader – Saying sorry is not enough – and a column by Donald Trelford (the ex-editor who thinks hacking isn’t much of a story). Elsewhere, silence. Well, not quite. Boris Johnson pops up in the Telegraph to argue the News of the World was not the only paper to have hacked. In a piece which makes light of hacking while calling on “every editor and every proprietor to appear before an inquiry and confess” to having been involved in such activities. This was just what the Times wanted to hear. It quickly drew on Johnson’s column to run a news story on page 4, Johnson calls on editors to tell the whole truth on hacking. This is nothing more than the continuation of a News International strategy to deflect from its own paper’s misbehaviour – and its accompanying cover-up operation – by spreading the muck. Greenslade’s full blog post is at this link. This entry was posted in Editors' pick, Investigative journalism, Journalism, Newspapers, Press freedom and ethics and tagged News International Holdings, News of the World, phone hacking, Roy Greenslade, The Guardian, The Times on April 11, 2011 by Sarah Marshall. Sky News is reporting that Richard Desmond has discussed selling the Express to the Daily Mail and General Trust. Writing on the Sky’s blog, City editor Mark Kleinman claims talks have taken place between the chairman of Northern and Shell and Lord Rothermere, chairman of DMGT. The two men are now said to get on reasonably well, and I understand both believe that a deal could be in their interests. A merger of the titles would create a newspaper powerhouse commanding weekday sales of more than 3m copies, according to the ABCs (which measure newspaper circulation) for February. It’s not clear what DMGT would plan to do with the Express if it did buy it. I’m told that it has considered launching a red-top tabloid to compete with the Sun at various points during the last decade, a consideration that would be fulfilled if it acquired the Daily Star and its Sunday sister title, which Desmond also owns. Kleinman’s blog is not the first to report on the potential sale of the Express. Last month the Evening Standard mentioned a possible offloading of the title when reporting Desmond’s readiness to sell three magazines, including OK! Roy Greenslade ponders what form a DGMT Express could take. To reduce national press ownership would be a mighty step at a time when there are increasing concerns about pluralism and diversity of voice. Of course, the nature of the merger need not result in the disappearance of the Express title. I guess it would be possible for DMGT to publish both papers. Given their current similarity, there would be no point in producing the Express in its current form. Perhaps it could be transformed into a cheap Mail (on the lines of The Independent‘s kid sister, i). Then again, maybe Desmond and Rothermere are just having a laugh. I say again: are they really being serious? This entry was posted in Business, Editors' pick, Newspapers and tagged Daily Mail, DMGT, Express, mark kleinman, Roy Greenslade, Sky News on April 4, 2011 by Sarah Marshall. Greenslade: Why are so few newspapers carrying the Prince Andrew story? I would have thought this story was manna from heaven for The Sun. It involves a member of the royal family enjoying what must surely be regarded as an inappropriate relationship. Isn’t that Sun territory any longer? This entry was posted in Editors' pick, Newspapers and tagged prince andrew, Roy Greenslade on March 1, 2011 by Sarah Marshall.